As I've noted before, my son is Mr. Christmas, Jr. To Zane, the holiday spirit is very important. We have to show Santa that we know how to have a good time. We have four, yes FOUR, fully decorated trees in our house, never mind that all four are currently on top of a coffee table so the puppy can't get to them. That's not enough for my son. He started talking about "lights" last week. Zane wants us to put up Christmas lights. Lots and lots of Christmas lights. As in "cover the whole house" Christmas lights. Normally, we like to indulge our only child during the Christmas holidays, and we make it a family thing if we can. But decorating the house with Christmas lights presents difficulties galore. We have a brick house. Where does one put the nails to hang lights on a brick house? I thought perhaps the eaves would do, but they seem to be some sort of vinyl. I am not clear on whether it is a good idea to put a nail into vinyl. Larry is not sure, either. Also, we have a two story house, and no ladder, because Larry and I both have balance issues, if holding onto the ladder for dear life can be considered 'balance'. Then there is the problem of the various critters who file through our yard, and the potential hazards to those animals, who like to chew first and ask questions if they live. We discussed all of our concerns with Zane, who heard "Blah, blah, blah, blah-blah." He found out that we had some old Christmas lights in the garage, and he bugged us until we got them out, never mind that they are all indoor lights that can't go outside. Zane was determined to have some Christmas lights to decorate the front yard. I started to feel guilty. Here is this wonderful, happy child, who is already excited about Christmas and everything about the experience, and his parents are clueless as to how to put up some silly holiday lights. How could Zane keep up the holiday spirit under these circumstances? Would we have to turn in our parenting certificates as a result of these failings? On top of all that, the boy threw us a curve ball. Zane decided that Santa wasn't going to come unless there were reindeer milling about the front yard as encouragement to the others. I thought that perhaps Larry and I could get away with just finding that 'reindeer cam' website. I was wrong. I finally sat down with Zane and explained that it was just too hot for reindeer to come to our house. I pointed out that reindeer eat a lot of grass, and they would probably want to eat the grass next door, which is actually greener than ours. In what I thought was the zinger, I told him that reindeer pooped a lot, and he would not be able to play in the back yard because of all the poop. That made him revise his original request to just one reindeer. 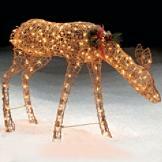 Lights AND a reindeer? We can do that, I said, and we all got into the car and headed for the store. We now have ONE light up reindeer in the middle of our front yard, and Zane has his Christmas lights.